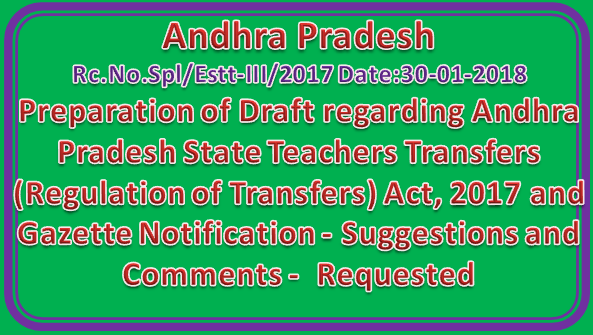 Sub:- School Education - Preparation of Draft regarding Andhra Pradesh State Teachers Transfers (Regulation of Transfers) Act, 2017 and Gazette Notification - Suggestions and Comments - Requested - Regarding. The Government of A.P has introduced counseling system during 1998 for the transfers of teachers in Mandal Parishad, Zilla Parishad and Govt. Schools.The counseling system has been continued till recent 2017 teacher transfer counseling in this system. In this regard Government has issued special rules for the teachers transfers counseling during each case for example: during 1998, 2002, 2005, 2009, 2011, 2012, 2015 and 2017. Separate GOs were issued every time. Due to lack of a permanent policy for teachers transfers in the State, lot of problems is emerging during the pre and also post transfers counseling. In this connection, during meeting held with the Teachers MLCs and Teachers Associations, it was suggested to propose for the permanent Act i.e AP State Teachers Transfers (Regulation of Transfers) Act for the Teachers Transfers in the State of A.P. as was in the neighboring-of State of Karnataka. Therefore, all the recognized teachers associations are requested to submit their suggestions and comments to finalize the draft for A.P State Teachers Transfers (Regulation of Teachers) Act.